It's hard to know what to make of Richard Torbay's recruitment into the Nationals. On one hand, the "traditional" direction is the reverse - Robert Oakeshott and Tony Windsor were both Nationals before defecting. Tony Windsor was elected as an independent in the state seat of Tamworth in 1991, having orignally sought pre-selection as a National. He eventually ran against the National candidate in the 2001 Federal election and was successful. 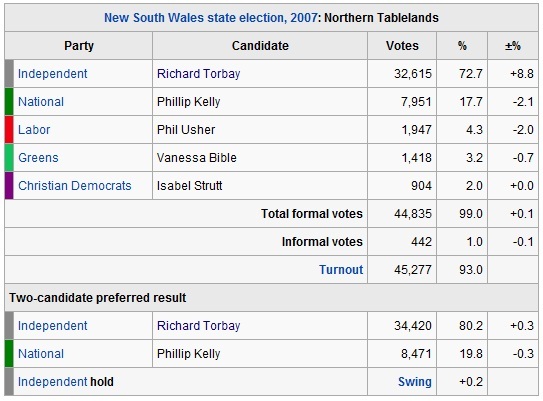 Rob Oakeshott was actually endorsed as a Nationals candidate and elected in 1998 in Port Macquarie. 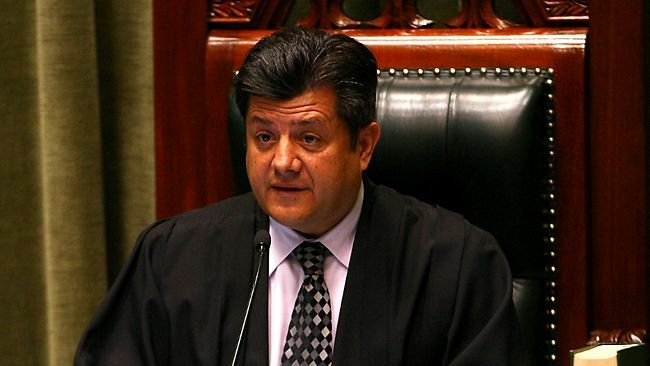 After disagreements on policy he resigned from the Nationals (thus losing a shadow-ministry) in 2002. When Mark Vaile resigned his Federal seat of Lyne in 2008 he ran as an Independant and won convincingly. So Torbay certainly wouldn't be the first. But what chance does he have of suceeding? Mumbletwits has written a great piece on that issue, and I'm not going to repeat what he has said. Read it. The really interesting part (for me) is going to be the result of the consequent by-election in Torbay's seat of Northern Tablelands. So we can rest assured that the Nationals should quite easily gain the seat. Given the general damage being done (rightly or wrongly) to the independent brand, there seems to be little prospect that some unknown independent could come from nowhere to take the seat. It will be interesting to see what is made of the results. Given that the past results were skewed by an independant who had been sitting as a speaker from 2007 to 2011, Labor's vote (3.4%) could hardly be seen to be a fair reflection of their support in the region. That said, if the ALP thinks they have a chance of winning the seat then they are hopelessly delusional. According to every poll since the election, their vote is still abysmally low. 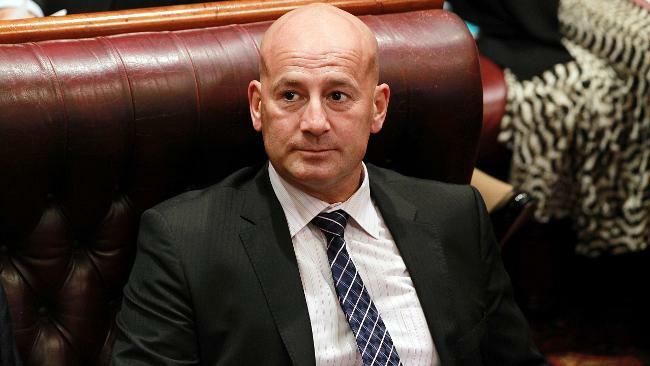 Labor's woes Federally are not going to do the State party any favours, and the Nationals will win the seat at a cantor. Is there any way the Labor party can sell a result as a win? Sure. Their vote will increase to (at least) double figures - a farily pathetic achievement, but one that may wash with the less observant among us. That said, one has to wonder whether any Labor members are starting to grumble about the astonishing lack of impact that Robertson is making on the electorate. Labor's numbers are not moving, he has zero profile, and despite O'Farrell making a number of unpopular decisions, no one seem to be moving out of the Coalition column. I wonder whether the by-election (whenever that eventuates) may just be a momentum that is needed to replace Robertson with someone who can actually start winning back some voters from O'Farrell. It will be interesting to see how an independent turned National will accuse a National turned independent of selling out.